I'm pretty sure I know the answer to this, but I thought I would post here before I pull all the corners and completely re-do them. We just got 15" of wet snow on Wednesday night. Normally it would have a cover on it, but I thought we were past these snowstorms and I've been working on getting the camper ready for camping! Anyway, I noticed yesterday as I was getting some of the snow off the roof (and watching streams of water roll down the sides of the camper), that all the putty in the corners are cracked pretty badly. My 2004 doesn't have cracked putty like this and I'm quite surprised the 2007 does. These cracks are about the width of my fingernail. I don't know how deep but I can only assume they are full depth and need to be addressed immediately. I don't see significant cracking (a little though) on anything other than the 4 corners shown in the pictures below. PO "said" he always kept a cover on it, but I'm starting to believing less and less what the PO told me. I don't see any signs of leaking "yet" so I want to deal with this before there are. I don't see any signs of this being a repair, it looks factory original. I was already planning on redoing the roof seals with Dicor and Eternabond (done that before on my first camper) as preventative maintenance, but I need to deal with the corners before I do any roof work. 1. Do I need to redo the corners by pull them off, cleaning and resealing OR repair them by just caulking over the cracks with Proflex? Obviously, no silicone. 2. Assuming I need to redo the corners, do you recommend Butyl Tape, then Proflex caulk or just Butyl? It appears the factory just used putty tape only. 3. Why did this happen? I know putty tape tends to crack eventually, but this seems quite premature. 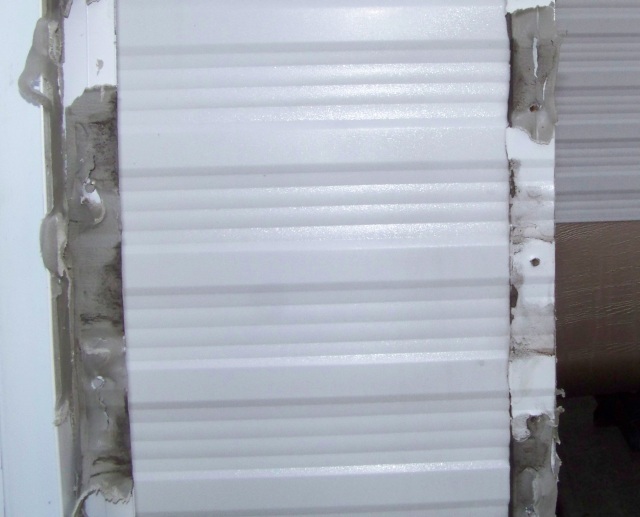 I had to partially rebuild my trailer so I used a layer or two of rolled butyl under the strips I took off. Just cleaned up the squished-out (industry term) extra. The other areas I just used non self leveling Proflex. I used Proflex over the butyl in some places too. I think I'm gonna eternabond tape my roof too rather than hope I didn't miss a spot. How hard were the corners to do? Were they are real pain or not so bad? The only time I've worked with the butyl (actually I think I used the gray putty) was to replace the water heater in my first camper about 6 years ago. The only difficulty I had on that was getting it to come loose. If you want a temp quick fix till the weather clears they make a butyl rubber in a caulking tube. Run a bead of butyl caulk a along the cracked area to stop any water invasion. You are seeing putty tape in action... Why does the 2007 have it and not the 2004? 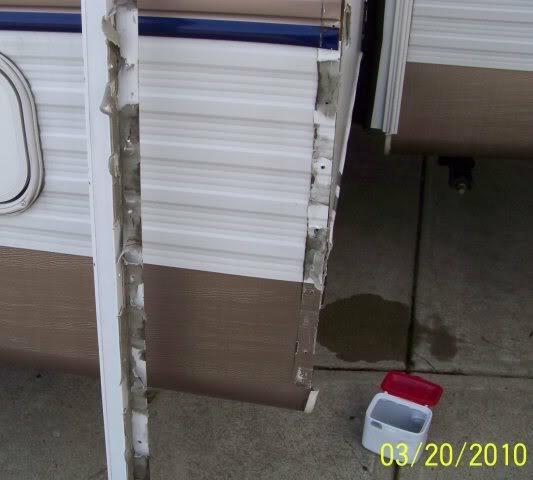 I can think of 2 reasons, the conditions the camper was stored or lived in affected the putty tape more than your 2004 unit. OR, the brand/quality of putty tape used in 2007 was not of the same quality as used in 2004. You will notice on the 1/2 way up the white siding there is a speckled light dirt looking marks and on the corner area where the corner strip would cover. Then on the gray putty tape is blackish looking to line up with that spot. If you can not see this, I will create close ups. There is dirt jamed in on the white siding all the way to the edge of the corner. There is only one way dirt gets in there like that. The putty tape separated and allowed it to get in. If dirt can get in, so can water. I replaced all that with butyl sealing tape. It does not dry out like the putty tape does. However you may elect to put a thin skim coat of non self leveling Dicor over the butyl as dirt can want to stick to the exposed butyl. That said, if you plan on keeping your new camper a long time, soon is the time to remove your corners and fix the issues. On my 4 corners I Dicor sealed the putty tape a month after I bought it. There where fine splits and I wanted to prevent the issue. Since 2007, the dicor is still good. I used masking tape to create a zone to not get it on the camper siding and it came out good. If you want to buy yourself some time to get to the long term fix, here is a trick I picked up. Dry out the camper edges. A good day or 2 of sunshine. 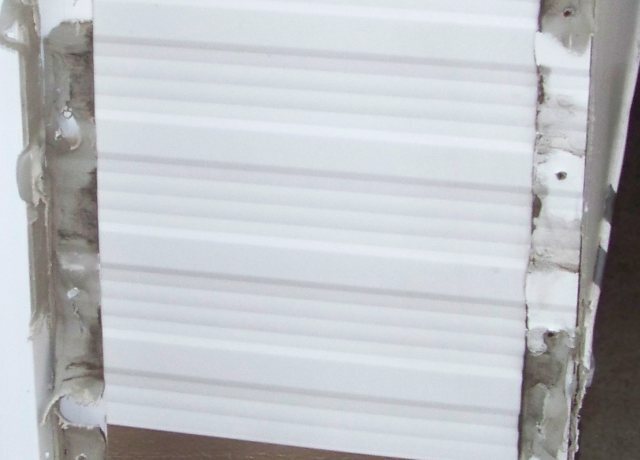 Get some butyl sealing tape, take a piece and roll it into a worm shape. Press the worm shape into the cracks. press it in good and hard to get it ~ 1/8 or more in. Trim with a plastic scraper and press smooth it out. This will create a temporally seal to plug it up until you can get to the to take the corners off and do it right long term. If there is water damage inside, it is already there and you can inspect when you pull the corner. Odds are 50/50 you have an issue. While mine had the dirt streak, I had no damage. I was lucky. But it was a slide corner. The camper 4 corners are the worst as the roof gutter can blast water into that seam. Or the top front ones coming off the roof where water can blast in. The key is you found this now, not a year from now. Odds are hopeful you can fix this up and then not have to worry about it. 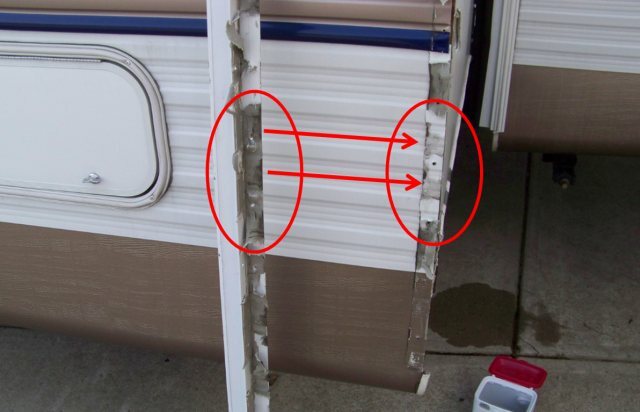 I myself knowing what I know about camper leaks, would spend the $15 -$20 on new butyl and do it. The corners are not that hard to do. Take your time, pry gentle and it will release. Using a hair dryer to heat the corner will make it release easier. 1 good weekend and your done. I created some close up's on the dirt spots which 2was allowed to get into this joint as a result from the putty tape releasing from the side of the camper. In case you have not seen this and want more on the repairs, see here. Lots of pics of redoing the butyl sealing. On my 4 corners I Dicor sealed the putty tape a month after I bought it. There where fine splits and I wanted to prevent the issue. Since 2007, the dicor is still good. I used masking tape to create a zone to not get it on the camper siding and it came out good. Thanks for the validation John. I won't bother with the temporary fixes, but I'll get the cover on it if I need to get it out of the weather. The first dry weekend (hopefully above freezing!) the corners are coming off. I want to reseal the roof as well, so the corners need to get done first. I'll post back on my progress. Did you use clear or white Dicor non-self leveling? Do you prefer Dicor non-self leveling over Geoflex Proflex for the corner sealing (over butyl tape) application? Sorry so long getting back to you. Been traveling for work. I used white non leveling Dicro. It blends in pretty good with the siding. I do not knw if they make clear Dicro. The Proflex, I myself have not used that so I have no good comparison. I myself would start with good high quality Butyl, 3/16 thick, 1" wide and then a thin layer of proper caulk of your choice over it on the outside only. Don't go near the silicone caulks for this. Wrong application. If you can, take some pics of the corner and if dirt/water filtered down in there and how far. And how they fold the siding over to help make a better seal. I've got all the supplies (butyl & white non-leveling dicro) I need and will start on the corners this afternoon now that we have a break in from the rain. I'll post pics of that project. I've been busy making steady progress to getting the camper ready; new Maxxis LRE tires are on, wheel bearings repacked, and Dexter EX Flex kit installed. I just found a good deal on a Hensley Hitch that I just couldn't fight off, so I brought it home and tore it down last night to repaint and replace seals & bearings (will post pics on this in another thread). After the corners I'm going to reseal the roof with self leveling dicro and apply Eternabond. This thing should be tight and ready to go in a couple weeks! Will like to see pictures of progress and I'm really interested in what you think of the Hensley Hitch! Front corners are off and everything is cleaned up and ready to put them back on except I think I have the wrong butyl tape. The stuff I bought is much firmer than what I expected and is 1/8" x 3/4" bought it here. I expected to double it up in the low spots and I tried that with this stuff but it just really didn't squish and spread out into the low spots like I would expect. I think it would be great on a smooth fiberglass sided camper but not so much on the aluminum ones. I'll be heading out to the nearest RV dealer in hopes they have the proper stuff. The good news is there was no water damage in the front corners. But I don't think it would have been much longer before water really started getting in there. You can see the dirt infiltration right into the corner. Bad news I found a soft spot right in front of the door that I hadn't noticed before, but I'll post on the separately. Scott, Great work!!! And just in time. Good for you. You will have her all sealed up better than new. And thanks for the pics. Your dirt spots confirm the signs. Once that happens, time and beating down water does the rest. Pending ones luck, your dry or not. Was it cold when you tried to use it? The butyl tape I have doesn't squish too good below 50 or 60 degrees (F) . Thanks for the good pictures. Yes it's in the 50's but I got some other butyl tape this morning and it squished out much much better. The dealer only had 1/8" x 3/4" so I ended up using 4 strips for each corner. 2 strips side by side double thick. Worked nicely. I only got a couple pics. I installed with all new stainless screws, trimmed the putty and caulked. The Dicor non-sag / non-leveling caulk was another story. Boy that is some tough stuff to work with - wow. I've laid miles of caulk in various forms, but never had anything quite like this. It skins over in under a minute and become the consistency of chewing gum on asphalt in the summer! Crazy gooey sticky! I'm gad I have another layer of sealant on the corners, but I'm not really happy with the quality of the bead I put down. I'm very particular though. This aluminum siding makes it especially difficult. I tried a light bead, a wet finger, a dry finger (don't do this), a wet soapy finger (best), and a carefully laid fillet bead shaped with the tip (this is how I typically lay caulk and can usually get it very nice, but not on the varied shaped of the siding). I've tried the making tape method before and didn't like it, but it might be the answer with this stuff. Sorry no pics of the caulk. We're forecasted with 3 days of rain, so I'll get them when I can uncover the camper again. I need to get that roof re-sealed with new Dicor self-leveling and Eternabond later this week when it stops raining.